An appropriate stem is crucial to maintaining a comfortable and safe bicycle. Stems can be key to achieving a perfect bike fit, as well, with a variety of stem lengths, slope, and materials. Here's a short resource to help our customers find the stem that best suits their needs. The emergence of carbon fiber as a primary material for high-end bicycles carried over to stems just as it did to seatposts and handlebars. There's no shortage of awesome-looking carbon stems on the market these days, and there's no limit to how much you can spend on them. Carbon allows designers and manufacturers a lot of room to sculpt and mold the material without compromising performance. No metal can be formed into the flowing lines of a well-made carbon stem. Carbon looks cool. 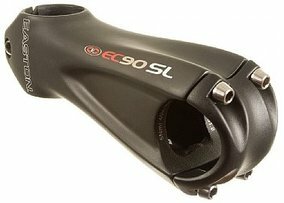 Check out the Easton EC90 SL Stem, for example, or the sleek Zipp SL Sprint Carbon Stem. Carbon also provides a much smoother road feel. If you've already got a carbon frame, we're talking pretty imperceptible degrees of smoothness, but carbon components can effectively smooth out the ride of a stiff aluminum frame. Carbon's greatest drawback is its durability. Stems of any material can be damaged in a crash or by over-tightening bolts, but carbon stems are especially susceptible. We advise anyone who has experienced slippage while installing a carbon stem or who has wrecked to have their stem checked out by a qualified mechanic before trusting it on a ride. The carbon might look okay, but it may have developed structural cracks that make for a much weaker stem, which can be a dangerous situation. Most stems today are made from aluminum. Aluminum is something of a magic material in bike construction and componentry due to its low weight and impressive stiffness. The primary benefit of aluminum stems is their reliability. In the event of a mishap, you'll know immediately if your stem has survived or not—and chances are, it has. It takes a lot to ruin an aluminum stem in a crash! 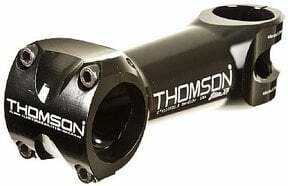 The Thomson Elite X4 Stem is one of the strongest stems in the industry. Aluminum stems can, however, be ruined by over-tightening, but even there, stripping out the threads is a bigger worry than cracking the bolt holes. As far as weight is concerned, carbon and aluminum are very close. Aluminum stems actually often run a bit lighter than their carbon counterpoints (the Ritchey WCS C260 Road Stem, for instance, weighs a mere 100 grams), and they generally cost less. While aluminum generally offers a stiffer ride than carbon, it won't make you uncomfortable unless you're actively trying to smooth out a particularly rigid bike. Length: The length between the center of each clamp. Clamp: Older handlebars have a diameter of 26.0mm, but "oversized" 31.8mm bars are becoming the new standard. Any bike shop can tell you which you have just by looking at it. Angle: Stems have varying degrees of angle and can be installed pointing up or down. A 6/84 stem provides a less dramatic rise or drop, while a 17/73 stem will put you in a much more upright position or down really low, the latter being preferred by many triathletes and time trialists. Keep in mind that the angle is relative to the steering tube of your fork, not to the ground. 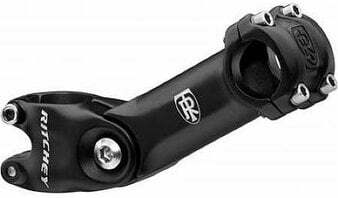 If you're not sure where to begin, the Ritchey Adjustable Angle Road Stem is just what it sounds like—a quality road stem with an infinitely adjustable angle. It's perfect for recreational riders who may enjoy changing their position from time to time to avoid soreness or someone who doesn't want to have to buy many stems to find one that works. We don't advise racing on an adjustable stem, since the extra clamped areas are not designed to absorb the massive amounts of torque that a racer puts into their stem. It's also heavier than other road stems. Let us know if we can answer any more questions for you! Give us a call at 1-800-682-0570 or drop us a line at [email protected].